From April 2017, any adult under the age of 40 will be able to open a new Lifetime ISA account, into which they can deposit up to £4,000 each tax year. They will then receive a 25% bonus from the government on any savings put into the account before their 50th birthday. Both the tax-free savings and the government bonus can be used for a deposit for a first home in the UK worth up to £450,000 at any time from 12 months after first saving into the account. 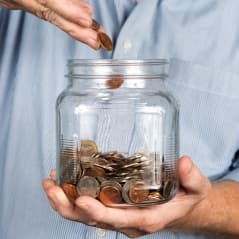 Alternatively the funds, including the bonus, may be withdrawn from the Lifetime ISA from age 60 tax-free, for any purpose. Lifetime ISA holders can access their savings if they become terminally ill.
Savers can also withdraw money before their 60th birthday for other purposes, but a 25% government charge will be applied to the amount of the withdrawal, together with a ‘small additional charge’. New amounts contributed to a Lifetime ISA will count against an individual’s overall ISA limit for the year (£20,000 from April 2017), as well as the Lifetime ISA limit. An individual will only be able to pay into one Lifetime ISA each tax year, as well as a Cash ISA, a Stocks and Shares ISA and an Innovative Finance ISA. Individuals intending to use the savings to purchase a first home may want to consider whether it is more beneficial to invest in a Lifetime ISA or a Help to Buy ISA, and the decision will depend on their individual circumstances. The table highlights some of the key differences between the accounts. As a general point, the Lifetime ISA is intended as a long-term savings product, whereas the Help to Buy ISA is designed to be a short-term savings product and is only open to new savers until 30 November 2019. During the 2017/18 tax year only, savers who already have a Help to Buy ISA will be able to transfer any funds built up before 6 April 2017 into a Lifetime ISA without these counting towards the Lifetime ISA contribution limit. Some taxpayers in their 20s and 30s could opt to save into a Lifetime ISA rather than into a pension. However, for higher rate taxpayers the government top-up on pension contributions is effectively 67%, so after full tax relief £6,000 of pension contributions provides an investment of £10,000. It is also important to consider withdrawal rules. Individuals who are currently eligible for a Lifetime ISA will be able to take money from their pension at age 57 (the minimum pension access age applying from April 2028). Yet they will need to wait until age 60 before withdrawing their money from a Lifetime ISA without losing the bonus, the accrued income associated with it, and also incurring a penalty. The biggest constraint of the Lifetime ISA will be the annual investment limit of £4,000. Those who can afford to contribute more than this may want to utilise their Lifetime ISA alongside making payments into a pension scheme. Please contact us if you would like more information on making the most of your wealth.